No one likes having to get up to turn off your computer. With the amount of people using their computer as a personal entertainment center, it has become the new TV. When your falling asleep in bed and you want to turn off your computer it's easy. All you have to do is hold the play/pause button for about 2 seconds and the computers will go to sleep. Thats it!!! 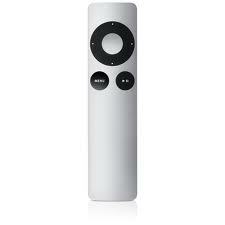 Pick Up Your Own Remote Here! We have all heard of the App Store for iPhone, iPad, and iPod Touch. Yet not everyone has had a chance to check out the brand new Mac App Store. The Mac App Store makes it just as easy to download all of your favorite Apps for your Mac computer. Anyone with Snow Leopard can use the Mac App Store, all you have to do is download the latest updates to your Mac then your ready to go! All you need in order to download Apps from the Mac App Store is an Apple ID. This is the same log in you use in the iTunes Store and the App Store on your iPhone. This means you can now download Apps for you iPhone, iPad, and iPod Touch all with one log in making it super easy to get all the Apps you want. The Mac App Store is divided in to five main tabs. These are Featured, Top Charts, Categories, Purchased, and Updates. This makes the Mac App Store very easy to navigate and find the Apps you want. You can see what is popular both in the Paid Apps area and the Free Apps area. The amount of free quality Apps is astonishing. You can find Apps that you will use every day that you don't have to pay a dime for. The Updates Tab will notify you if there are any updates available for any of your Apps, so that your Apps all stay completely up to date. One problem some people run into when they buy themselves a new computer is getting all of the applications onto their new Mac. In the Mac App Store you have the Purchased Tab. This allows you to easily download all the applications you bought in the past quickly to your new Mac. This makes it easier then ever to get your new Mac up and running. 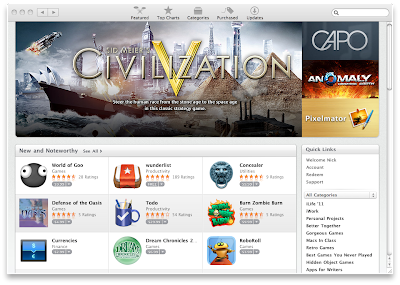 The Mac App Store is one of the best things to come out for the Mac in the last few years. Check it out now!